I just finished my new spy novel – the second in the series, “The Secret Lives of Jessie Monroe:” Who is Juno Wolfe? I’m super excited about this book. I’d love it if you read the first book in the series, “Alias Juno Wolfe,” and then this one, but you don’t need to: they stand alone. My daughter Kristin was one of my proof-readers and said I need to get this one released ASAP. I started it a year ago, yet it predicts the recently breaking news occurring after the book was sent to the publisher: Russian hacking of our networks! And wait until you see what happens next! Kristin said it was an important book for people to read today. It wasn’t originally meant to be a political novel, but I admit I have been worried about the trends I have been seeing in the U.S. I’m not talking about any specific president(s) (really I’m not), but more the trends towards Corporations taking over government (both parties) and the resulting negative effects. On the other hand, it’s also a fun spy novel so politics aside, I hope you enjoy it. The book is set seven years in the future, where these negative trends have continued and America has degenerated. Like “Atlas Shrugged,” the book depicts a dystopian United States, updated and based on current events. Only our heroine can set them straight. It’s both a warning about the future and an optimistic view of how things can be returned to the right course. Let me know what you think! It’s on Amazon and you can get to it from http://www.Goodreads.com. My first children’s book, “The Fable of the Farmer and the Fish,” was very well received, especially by parents and children concerned about the awesome California Delta and preserving it for future generations. There was still another story I wanted to tell related to the California Delta, and that was the current plight of the native salmon species and what the State should be doing to reverse the current trend of over-exporting water from the Delta to the South and causing the salmon’s demise. Our story starts out as the little salmon hatch. The mother salmon laid her eggs in the cool river water. She laid a hundred eggs in the nest and then, satisfied, she sighed and swam away. She had fulfilled her purpose. In the spring, the tiny fish hatched. “Hi. My name is Sassy,” said one little fish to the others. “What’s your name?” The brothers and sisters introduced themselves and began to swim around and play. One little fish was smaller than the others and two big boy fish were teasing him. “What’s your name, little guy?” Sassy asked. “Sassy the Salmon” is a story of hope – hope for common sense to come to the forefront and hope for those in charge to start reversing the negative trends and restore the Delta to the healthy and clean river it should be. My daughter, Kristin, talked me into illustrating this book. She picked water colors as the mode since, she said, it’s about water, after all. I hadn’t painted with water colors in years, but she found “how to” videos, went to art supply stores with me, and together we started. She encouraged me, saying she liked the art and so I continued. For me, it was a project of hope and love. I finished “Doug’s Last Laugh”, but there was another story nagging at me. I had this secret persona I’d thought about on and off. Yes, me – the good little Mormon girl from Utah had often thought through spy scenarios when falling asleep, to entertain myself. This one in particular kept coming back. It was about two twins, Jessie and Jimmy Monroe. When they were small, they met their uncle for the first time and to their surprise, he looked exactly like their dad. (Uncle John and their father were twin brothers – identical). They didn’t know then why they’d never met Uncle John before, but it was because he was a spy for the CIA and not into family get-togethers. But they did finally meet once. As the twins leave the restaurant with their parents while Uncle John pays the bill, gunmen, mistaking their dad for Uncle John, mow their parents down in cold blood, right before the two small children. The trauma puts the young twins into a state of shock. Uncle John takes them in, but doesn’t know what to do with them. They survive by clinging together and speaking in a language only they can understand. Uncle John brings in tutors, but all the twins are interested in is math and science – subjects with little or no interaction with the teachers. After many years of being isolated and home-schooled), Uncle John does find, finally, something they will leave the house for – martial arts. So here you have this combination – extremely intelligent, technical twins highly trained in combat. Their uncle is a CIA spy. Hmmm. That seems like a good basis for a smart, tough female spy novel. Here we find Jessie in her undercover operations as Celeste, companion of Roberto, a Columbian drug lord. Later, Jessie goes undercover as Juno Wolfe, a software security guru who identifies a plot to use delivery drones to attack the nation’s capital. It was a lot of fun to write – I hope you like it. If you do, please add to the Amazon Reviews . Thanks! After I finished writing “It Starts with an Idea“, and then wrote down my memoirs for my grandchildren, “Class of ’67”, I had the writing bug. There was a story I was wanting to tell about our best friend’s dad, Doug. Doug was like a father to me. When we moved from Utah to California, Doug always welcomed us into his home as if we were part of the family. I loved it, because my father had died years before and my mother died shortly after we moved to California and had our two babies. Even my mother’s second husband died shortly after she did, from a broken heart. Doug was funny, witty, and always on-the-go. Some people thought his humor was over-the-top, but I loved his humor and him. So, how should I tell the story? I thought of writing it as a non-fiction, like my prior two books. People were giving me great feedback on them, said they liked my writing style. But our friend was somewhat private about things. He’d worked on classified government projects with clearances and didn’t trust having a FaceBook page. When they decided to write a travel blog, they opted for WordPress instead of FaceBook so they could control the audience. So I didn’t feel comfortable writing about he and his family. Instead, I decided to use the experiences I’d had with Doug and create a different person and family and wrote “Doug’s Last Laugh”. Most of the activities did occur, but not always to the same family members. I made up a new family, put my friend and my husband in it as twin brothers, and voila – I became an actual member of the family, a daughter-in-law. The ending is the true, special story of hiking to a tall, tall mountain in Montana to spread Doug’s ashes, to say goodbye to Doug, the man we all loved. That was a constant request from our little Sassy (our nickname for Serenity). “What’s the first?” you ask. I started reflecting back on my childhood and growing up in Utah. As a young child, I lived in a very homogenous (aka white), Mormon neighborhood. All of the kids in my elementary school were white and Mormon, except Joanne who was Catholic and the kids teased her about that. That’s not exactly right. I had a good friend who was Japanese but in general, white and the same. Until junior high, that is. Our junior high was right on the board of the East Side of Salt Lake (where we lived) and the West Side (across the tracks). Arriving at junior high was quite an eye-opener. I remembered one day we even had a rumble – quite “West Side Story”-ish. I wanted to do more than write stories, I wanted to create the atmosphere from that time. Growing up in the ’50s; the vibrancy, how we lived and played. So I wrote it more like a novel – starting out in the summer before I headed off to school at junior high the first time. I awoke at 7 a.m. to the sound of the drums. Boom, ba-da boom, ba-da, boo-boo-boo-boom. It was the beat of the South High Pep Club, who would be practicing at Liberty Park every morning for the next two weeks. The park was very near to our house – close enough that the drum beat echoed through my bedroom’s open window. “Argh,” I thought as I tried to pull the covers over my head. My sister Kathy, five years older than me and soon a senior at South High, would already be at the park, going through the routine with the other Pep Club girls. But for me, it was supposed to be a lazy summer morning, and I had planned to sleep in. I would be starting junior high soon, and needed my sleep. We had only two weeks left until school started, and I hadn’t wanted to be woken up early. Then I heard the pans crashing in the kitchen and knew Mom was making her oatmeal. She always ended up making a huge noise in the kitchen when she was trying to get her small oatmeal pan out from under the bigger pans for her early morning breakfast before going to work. I dragged myself out of bed and padded into the kitchen. Then what to name it. My first choice was “On South High!” the opening words from our high school song. But my husband and others who hadn’t attended South didn’t “get it.” So then I picked my high school graduating class, “Class of ’67”. I used pictures from our yearbook and our school colors, blue and white on the cover. As luck would have it, I published it shortly before our South High Class of ’67 had its 50th Reunion. Needless to say, it was a big hit at the reunion (I took extra copies). Even my sister’s friends bought it (and she was five years ahead of me in school). They all said how it reminded them of their school years and what a fun read it was. That was so exciting. I think I need to write more books! “It Starts with an Idea” is finally published and available on Amazon – Click here. Read about the adventure of a start-up in Silicon Valley. The book interlaces the story of the start-up Intelic (renamed “Azerity” in 2001) with stories from prior jobs, valuable lessons learned. The book reveals how Intelic created a dedicated and enthusiastic team – a team that worked hard and had fun – and a great product. Now that we’ve finalized on a book title and sub-title that ties in, the final draft proof is on its way in the mail. 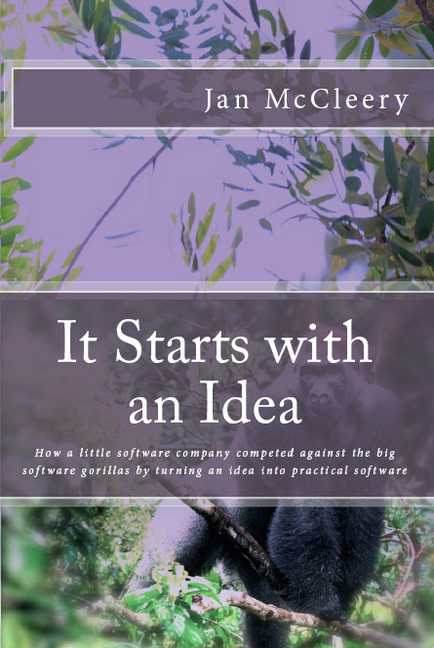 The title and subtitle are: “It Starts with an Idea” – How a little software company competed against the big software gorillas by turning an idea into practical software. Our friend, Pete, came up with the title, which was actually one of the early chapter titles. Since the book is about a start-up, it made sense to use that as the title. I like it. One final review then it goes to Amazon to publish a print and Kindle version. Hope you like it! OK – No one likes either of my first two book name ideas: “Gorilla Warfare” (sounds like a story about combat if you don’t know how to spell, or an issue in the jungle with real gorillas if you do know how to spell) or “Practical Software” (sounds like a boring technical manual). People suggest that since it is such a fun read, it should have a title that draws people to read it other than just software geeks. Something catchy that would cause people to download it from Kindle. The byline is “How a little company competed against the big software gorillas by building practical software” (that is working well), the book talks inside about competing with the big software gorillas, and so the cover has a gorilla on the front, little chimp (our company) on the back. “It Starts with an Idea” – that’s actually one of the early chapter titles. “Safari into the Software Jungle” – unless it’s too long. “Software Safari” – if the above is too long. But the one above sounds more fun to me. Draft copy of “Practical Software” being reviewed! A simplified explanation that even children will understand describing the fundamental issue behind the California water wars, the war between the protectors of the Delta in the North and the Corporate farmers in the South. The story shows why the Bay Delta Conservation Plan (BDCP) and Governor Brown’s Delta Tunnels are not the needed solution and proposes a real, long-term solution. Set in the format of a children’s book. This book is valuable for all ages but simple enough for Kindergarteners. For younger children, it teaches the value of responsible sharing and the need to take care of our environment. Proceeds go to Save the California Delta Alliance (STCDA). What is “Retired” in the 21st Century? Is there a role for a Requirements Document in Agile? Can Documentation be part of the Definition of Done? Lessons from the Moon. Gotta have good documentation! Can ‘Agile’ and ‘Architecture’ Co-Exist? Where do you go to see what the code “really” does besides asking a developer? A company for 2008 and beyond.